Of the many the thru hiking accounts I’ve read, most open with either a) a scene of transcendent beauty/personal revelation or b) a moment of excruciating pain/extreme challenge. Think of the opening scene in the movie Wild, in which Reese Witherspoon, playing hiker Cheryl Strayed, hurls a bloody hiking boot into a deep gorge with a scream of rage. But a month after completing my own, unconventional, somewhat unexpected Appalachian Trail thru hike, no singular moment of mysticism or misery has elbowed its way upstage. Instead, I keep coming back to a hiker I first met about 600 miles up the trail, in southern Virginia. Lava Monster, Patches and Pony at the quarter-way mark, a day before meeting Two Pack. The members of my unexpected crew — you’ll meet them later — and I were cooking dinner with other hikers at Jenkins Shelter (mile 578.6) when a petite young woman tottered up, burdened by an enormous pack. She was trailed by a grimacing older man, who made quick, angry work of pitching his tent, then disappeared inside without a word. The girl set down her pack and started chattering nervously. Fine blond hair, cut short, framed her narrow face and her blue eyes were friendly, but fretful; there was something quavery and frail about her that reminded me of a baby bird that had fallen from the nest. I was surprised when she said she was 23 and a college graduate. Her companion, First Step, was a kind of chaperone, a former college professor she’d recruited because her parents wouldn’t let her hike the trail alone. Her trail name was Two Pack. Over the next few hours, she talked almost nonstop, and I wasn’t the only one who had a hard time imagining how she had managed to survive nearly 600 miles of the trail. She seemed to know very little about camping or cooking. She lay the rain fly to her tent on muddy ground to “dry” as a light drizzle prickled down from a gray-cotton sky; a friendly husky staying at the shelter quickly circled several times and plopped down on the convenient ground cover for a rest. And when she pulled her boots and socks off, she revealed narrow, pale, blister-ravaged feet whose toes seemed strangely stacked atop one another, almost crumpled. With her companion awol in his tent, shelter denizens took pity on her, helping her cook and offering advice. I shooed away the dog and helped her hang her rain fly, and tried not to stare at her battered Picasso feet while handing her a thick roll of miracle-working Leukotape for that violent-looking crop of bloody blisters. Though she usually pitched a tent, that night she nested securely among the many-colored lumps of a full shelter that night. The next morning when I rose at 5:45 I saw through a misty gloom that First Step had already packed up and left camp, abandoning his charge. When she woke a short while later, she really was shaking a little bit. Was he gone for good? In classic, laconic hiker style, many of us offered words of encouragement. A couple of hours up the trail, our crew passed a guilty-looking First Step, who wanted to know how Two Pack was doing. Cool, even a little remote — you don’t just bail on people like that — we all said she was fine; she was awake and gearing up to head out when we left. She would sink or swim now, on her own. 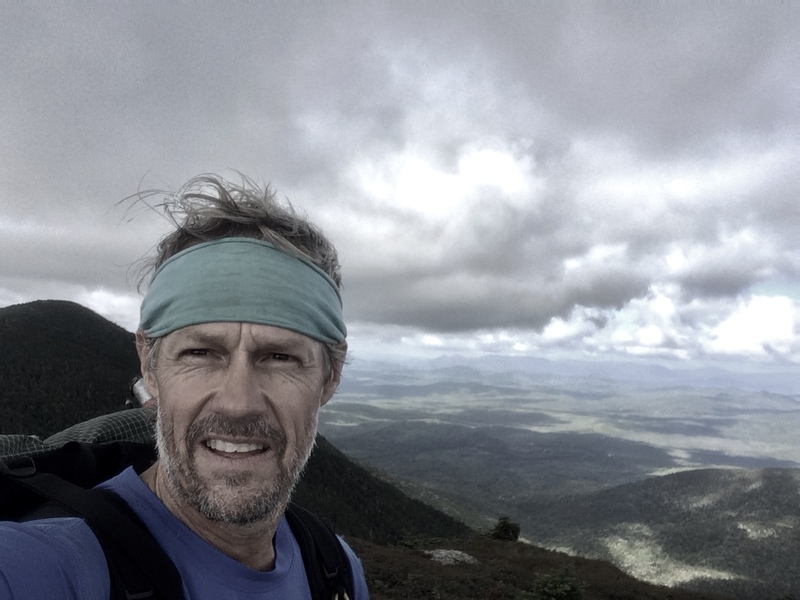 Four months later, I had become a southbounder — or rather, a flip-flopper, having jumped off in Vermont and gotten back on at Katahdin to finish my trek. I had just rock-hopped across the nearly dry Piscataquis River on a warm, late-August day, slipping at the last minute and soaking one shoe. But I was feeling good, having just knocked out the first 90 miles of the 100-Mile Wilderness in four days. Now I was sitting on a rock, wringing out my sock, when a fast-moving woman in purple breezed by, grunted a hello, and picked her way quickly across the stones. She was soon followed by two companions, the first of whom I immediately recognized. “No way! Two Pack!” I shouted, jumping up, genuinely feeling more elation than when I’d summited Katahdin just a few days before. She looked me over and clearly didn’t recognize me. Her once doubtful blue eyes now seemed steely, almost grim with the same thousand-yard stare I’d seen on the faces of so many northbounders (aka NOBOs) who were plunging through the wilderness like hounds on a scent. But I could see she didn’t need a compliment from me or anyone else. She had gotten up that chilly, foggy May morning in Virginia and, taking the advice of other hikers, just started walking. I learned later that her erstwhile chaperone bailed out in Pearisburg — and she kept going. Now, some 1,500 miles later, she’d be catching her first glimpses of Katahdin within a few days. One step at a time, sometimes on painful feet, she had walked right past all her doubters — her parents, her former professor, my crew — to prove that she was tough and resourceful and resilient. Of course, she didn’t do it alone. Nobody does. Other hikers, yes. But most of all, she had the best teacher in the world: the trail.